Guess who started his term with a bang? Bank of Japan (BOJ) Governor Haruhiko Kuroda did! Unless you’ve been hibernating in your parents’ basement, you should know that it’s only been a couple of days since Kuroda replaced Masaaki Shirakawa as BOJ head. More importantly, you should remember that Kuroda was hand-picked by Prime Minister Shinzo Abe, who has promised to do everything short of selling his momma in order to boost the economy and end Japan’s 15-year deflation. Well, the protégé certainly didn’t waste any time! After building up the markets with talks of more stimulus and commitment from the BOJ, Kuroda finally unveiled the BOJ’s monetary policy targets for the next couple of years. And guess what? Their plans are even bigger than the already sky high expectations! Aside from the changes above, the BOJ has also decided to temporarily scrap the No Banknote Rule, which limits the BOJ’s long-term bond holdings to the value of bank notes in circulation. Not only that, but the central bank will also step up its purchases of other assets like exchange-traded funds (ETFs) and real estate investment funds (REITs). So how did the market react to all this news? It dumped the yen, naturally! 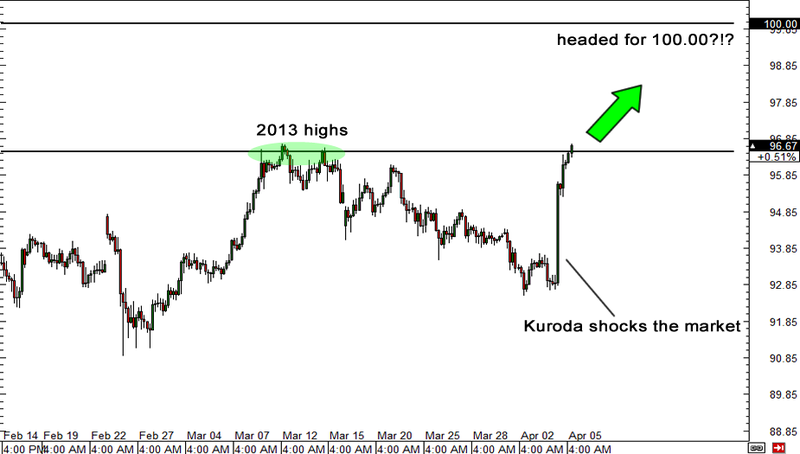 Many believed that Kuroda would disappoint market expectations and would fail to make any significant changes. But of course, Kuroda came out swinging and completely overhauled the central bank’s monetary policy. In turn, yen pairs zoomed up the charts, with USD/JPY gaining an impressive 400 pips over the past couple of sessions, and as of the Tokyo session earlier today, was trading at the 2013 highs at 96.70. Mr. Kuroda, if your goal at your first official monetary policy statement was to make a… um, statement… then, Mr. Kuroda, you have succeeded! I think it’s pretty clear that Kuroda means business and that he will be dedicated in his efforts to boost the Japanese economy. That said, I won’t be surprised if we see USD/JPY soar all the way up to 100.00 in a few weeks! What do you fellas think? Do you think 100.00 is out of the question? Do you think USD/JPY will hit 100.00 by the end of the month?